Back issue Editorial March 99: "Autumn Fruits"
This update, coincides with Autumn equinox and is pretty full. There's something about the workshop by Robyn francis; news about the reform of the law around shared ownership, and also details about Waitakere Eco-Neighbourhood's recently acquired site in Ranui. 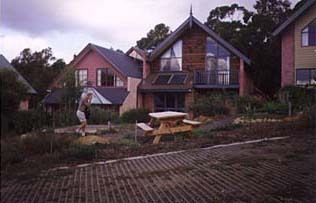 The 5 day Eco-Village workshop ran by Robyn Francis from Australia was a great success. 14 people attended from far and wide, with pretty much everyone from farmers to developers included. Unfortunately due to the lateness of its organisation many were not able to attend. On the resource page is a brief write up from the workshop. Three main lessons were: integrate eco-villages with existing communities and townships; get in and lobby for more appropriate laws; and be prepared for the huge energy required to get projects off the ground. Speaking of more approriate laws, the law commission has just produced a preliminary paper about the reform of crossleases, unit titles and company titles. We knew this was in the wind, but this report is seeking submissions by March 31. It is only a first reportmore substantial reports will be produced later in the year, one especially about the reform of Unit title. Robyn spoke of their ongoing work over 8 years to get the NSW Community Titles Act in place. So if we want Eco-Villages to have a suitable legal framework, now is the time to get involved. Find the web copy of their report at www.lawcom.govt.nz. The Waitakere Eco-Neighbourhood Cohousing Group are all yahooing at present, I can hear them from here! (Ahem, well thats because WENCP is something I'm involved with.) After 4 years of preliminary work in group building and gathering resources a 4 acre site became available. Its flatish, fertile alluvial and has been under organic production for 30 years. And yes Robyn Francis its only 2 doors along from the Ranui village shops. This is very exciting news. If you haven't visited for a while, there are a few new articles on the resource page, some new links, and the notices page replaces the old network page. This is an automated noticeboard for if you want to get information out about what you are doing. This also replaces the EcoVillage Voice email list. Plans are a foot to enable email copies of notices to be delivered to you, if you choose. Generally though the website generally gets updated every few months, and any contributions are welcome.